Since there is no way to stop severe weather, being ready for it is key. 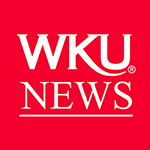 That preparation has resulted in WKU being designated a StormReady® University by the NOAA National Weather Service Forecast Office in Louisville. John Gordon, meteorologist in charge, and Joe Sullivan, warning coordination meteorologist, made the presentation March 20. 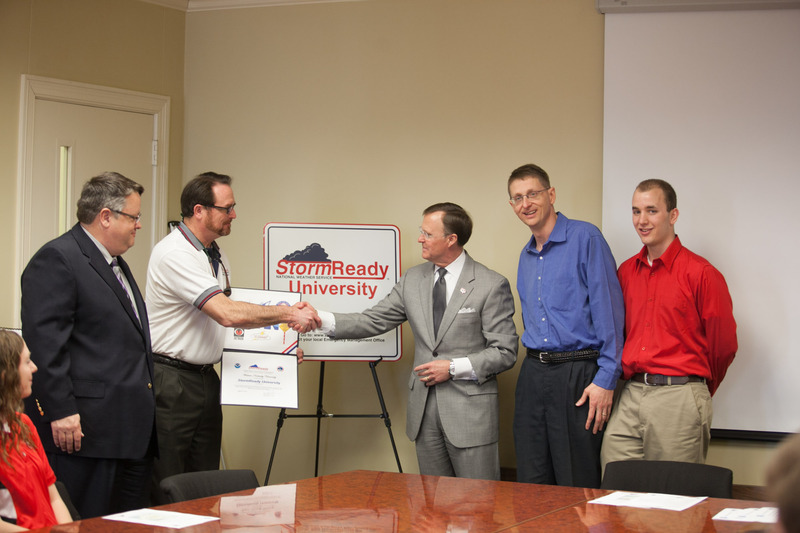 WKU has been designated a StormReady University by the National Weather Service. Participating in the presentation were, from left, EHS Director David Oliver, Joe Sullivan of the NWS, WKU President Gary Ransdell, John Gordon of the NWS and WKU student Austin Boys of Greeneville, Tenn., a member of the StormTopper Network. 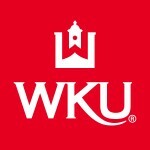 The designation comes after an application and review process spearheaded by meteorology students in WKU’s StormTopper Network and coordinated by Oliver and his staff. Sullivan said the designation is a result of a partnership between various areas of the campus, the National Weather Service and Emergency Management. He said members of the StormTopper Network participate in and contribute to discussions during severe weather outbreaks to improve the situational awareness necessary to effectively warn the public. “It’s incumbent to know what’s going on ahead of the storm,” he said. Students in the StormTopper Network work with WKU Police and the EHS staff as spotters for severe weather. They also monitor radar and information from the Kentucky Mesonet weather-monitoring network. Gordon said the university’s ability to warn the public through several methods, such as outdoor speakers and text messages, is a key part of the designation. WKU is the fourth university in Kentucky to receive the designation and the 129th in the U.S. Sullivan said that makes WKU “a very progressive university and puts you way ahead of the pack” of the hundreds of institutions across the country. The National Weather Services says StormReady® communities are better prepared to save lives from the onslaught of severe weather through advanced planning, education and awareness. Contact: David Oliver, (270) 745-4148.